London Renters Union is a new campaigning union for private renters. We know that the capital’s housing crisis has put all of us who rent in a desperate situation. London rents are the highest in Europe, yet protections for renters are among the weakest. With tenancies as short as six months and evictions at a record high, many of us lack a secure place to call home. Many of us live in poorly maintained and even unsafe housing. But it doesn’t have to be this way. All over Europe, renters have won good conditions, lower rents and longer tenancies. We can do the same here. Here are 5 reasons why you should sign up as a member today. 1. If you have a housing problem, you won’t face it alone. When you have a problem with a landlord or letting agent, it can feel very isolating. Whether they are withholding your deposit, refusing to do repairs, harassing you or trying to evict you, it’s easy to feel as if they hold all the power and you as a renter have none. We can make sure that you won’t face housing problems alone. By meeting, sharing experiences and taking action, we support each other to stand up to the landlords and estate agents who exploit us. 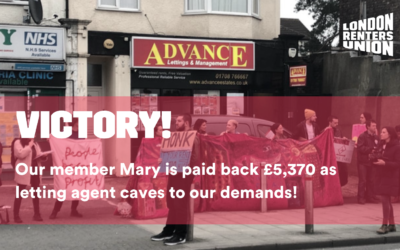 Being a member of London Renters Union means joining a community of people who know what it’s like to live precariously in the private rented sector – and who have each other’s backs when problems arise. 2. We’re taking action and winning. Since London Renters Union launched in 2018, we’ve won for individual members and as part of national campaigns. Some of our members in Lewisham and Newham have had long-standing disrepair issues – and were getting nowhere through individual complaints. By taking collective action as a union, we’re successfully forcing landlords and property companies to tackle the poor conditions and make repairs, in some cases securing rehousing. We’ve also successfully prevented evictions through direct action. We supported the traders at the historic Ridley Road market to organise and campaign against their planned eviction. Together we successfully prevented eviction of the traders. 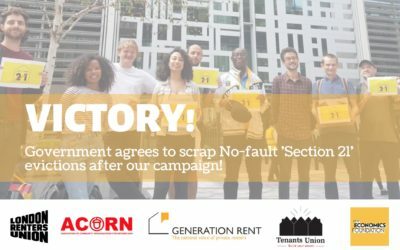 We’re also campaigning for changes to the housing system, such as calling for an end to Section 21 “no fault” evictions. The Labour Party recently announced its support for abolishing Section 21 – a win for London Renters Union and the #endSection21 campaign. Find out more about what we’re fighting for here. 3. We all know London’s housing system is broken. You’ll be adding your voice to a growing movement for renters rights. We don’t want to stop at battling individual landlords. The housing crisis can’t simply be blamed on a few bad apples who abuse the system. Our housing system is rigged in favour of landlords, developers and property companies while the rest of us lose out. But a mass union can build renter power, helping to shift the power imbalance between renters and landlords to transform housing for everyone. If renters join forces, we can fight for the immediate changes we need, like longer tenancies and lower rents, while also building a movement for homes for people not profit. Read more on what we’re fighting for. 4. You’ll be supporting your fellow renters in their battles against landlords and agents. You might be lucky enough to be in a stable housing situation right now. Whatever your current circumstances, your insights and experiences can contribute to the collective knowledge that helps all renters fight back. Our current housing system leaves renters precarious and the best of situations can change at a moment’s notice. 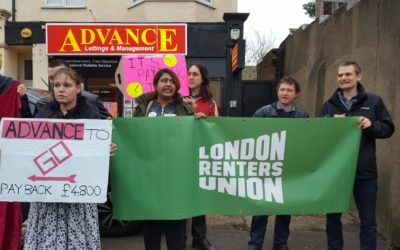 Even if you don’t have a housing issue at the moment, by joining London Renters Union and becoming active, you’re helping build a strong movement for renters rights, and a union that will be there when you need it. 5. Housing struggles are key to creating a radically fairer society. Our rigged housing system is the site of social injustices that ripple through all aspects of Londoners’ lives. If we transform the housing system, we transform our city. Extortionate housing costs are forcing one in four Londoners into poverty. Working class people and those on low incomes are being pushed to the fringes of the city. The rollout of universal credit is a growing disaster – many people receiving benefits are facing a shortfall in housing costs or discrimination in their access to housing. Schemes to tackle “rogue landlords” have turned out to be about border control rather than improving things for tenants. Meanwhile the government’s “right to rent” legislation has meant that many migrants and people of colour are facing difficulties accessing housing. We’re fighting to end the discrimination faced by people on low incomes, migrants and people of colour. London Renters Union stands in solidarity with struggles over precarious work and with anyone marginalised by our current economic system. By joining us you’ll join the fight for a more just, equal and inclusive society. 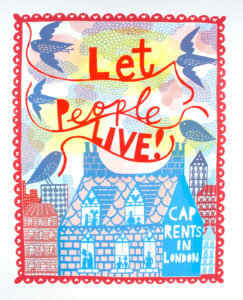 Join London Renters Union for £4 today.